How to watch 3D movies on Samsung Smart TV? Samsung, like many TV manufacturers, has a bewildering range of models. Even if you’ve already decided to discount a plasma set, there are still scores of LED TVs to choose between. But Samsung Smart TV is your best choice. Samsung Smart TV lets you find and control exciting content in new and unexpected ways. You can access Apps, Signature Services and browsing are easy. Enjoy an exceptional picture and a TV experience like never before. I think you have got Samsung Smart TV. Are you ready for watching 3D movies on Samsung Smart TV? I’ll share an easy way to play 3D movies on Samsung Smart TV with you. Below is needed for watching 3D movies on Samsung Smart TV. Are you still worrying about looking for 3D movies? Can the Samsung Smart TV convert 2d to 3D? The answer is “No”. 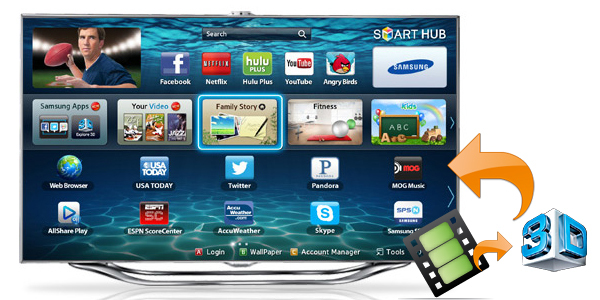 Samsung Smart TV can stream any video. So, we suggest you convert 2D movies to 3D with 2D to 3D TV converter. Video Converter Ultimate is the best. If you are Mac usre, you can free download Video Converter Ultimate for Mac. Convert 2D to 3D for Samsung Smart TV, convert 2d to 1080p 3D movies for Samsung Smart TV, convert DVD to Samsung Smart TV via 3D effect, rip Blu-ray to Samsung TV playback format, convert 2D AVI/MOV/MKV/WMV/M4V to 3D video etc. You can free download Video Converter Ultimate or Video Converter Ultimate for Mac. Guide: How to convert 2D movies to 3D for Samsung Smart TV? 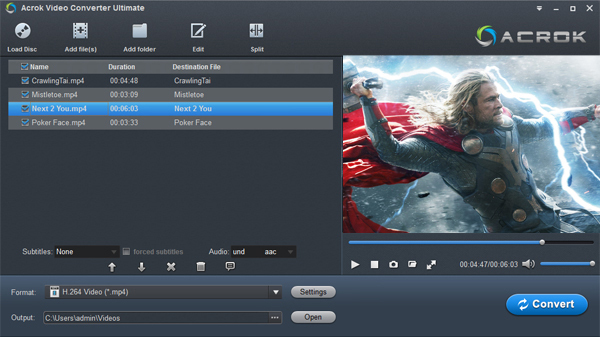 Step 1: Install and run this 3D TV Video converter, click “Add Files” to add 2D movie files into this 3D Video Converter. Click “Output Format” bar then click “Format”, you will see many formats. Here you can choose “Samsung HDTV Video (*.mp4)” under “HDTV” category. This profiles video encoder is H.264, Audio encoder is AAC, Video Resolution is 1920*1080. This format is the best format for watch 1080p 3D movies on Samsung Smart TV. Tips: A watermark will be displayed on the output video files. In order to save your precious time and show the effect, we suggest you trim the video before convert. Click “Edit” to enter Edit interface, then add 3D effects as you needs. Click “Convert” to start converting 2D to 3D when everything’s ready. When the conversion is done, click “Open Folder”, you’ll get the converted video files. You can transfer the video file to your USB. That’s all. Now, you can watch 3D movies on Samsung Smart TV.